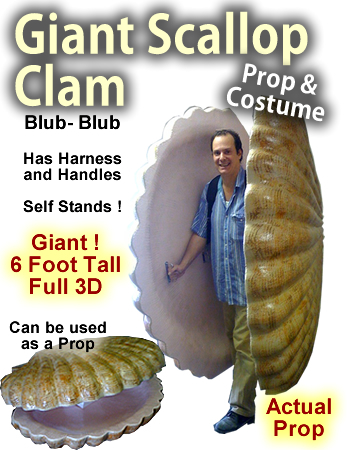 6 Foot Giant Clam/Scallop Foam Prop/Costume - Dino Rentos Studios, INC.
Great for Under The Sea themes. Can be worn as a costume or used as a free-standing prop. Shell is hinged in the back to open and close. Select your shell size below: 2 - 6 toot tall. Call us for a customized version. 1 side of 6 foot shell available for $1,595. Call us to order.